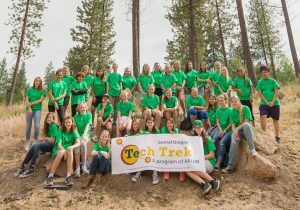 Tech Trek Central Oregon is a local, week-long camp at Oregon State University’s new Cascades Campus for girls who are passionate about Science Technology, Engineering, and Mathematics (STEM). 72 rising eighth-grade girls from Jefferson, Crook, and Deschutes counties will attend the camp June 24th to June 30th, 2018. Tech Trek is uniquely designed for girls and offers a first-hand look at how exciting careers in the science, STEM fields can be. At Tech Trek, girls are immersed in a world that empowers and encourages them to think about themselves as future scientists, engineers, mathematicians, and computer specialists. Our camp is supported by the generous donations of local and national sponsors. Those interested in supporting our camp can visit our Sponsor a Girl Page to learn more.